Dewitt Rotary has been a partner, providing financial support and volunteers, for the Butternut Creek Trail Project, their longstanding Rotary Centennial Project, whose object is to improve the trails and park amenities along Butternut Creek. The project has been done in partnership with the Town of Dewitt. 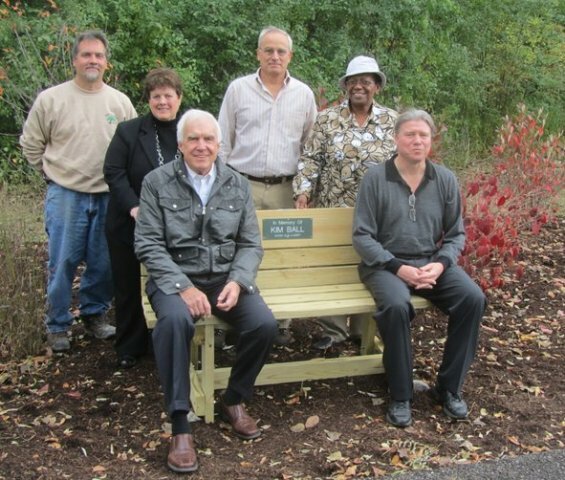 DeWitt Rotarians and local officials gather around a new bench at the Butternut Creek Recreation and Nature Area that the Rotary Club dedicated in memory of former Parks and Recreation Director, Kim Ball. Pictured from left are: DeWitt Superintendent of Parks, Dale Longden, DeWitt Rotary President, Sue Reisman, Rotarian Don Burns, DeWitt Director of Operations and Sustainability, Mike Moracco, Rotarian and County Legislator, Linda Ervin and DeWitt Town Supervisor, Ed Michalenko. DeWitt Rotary is still seeking cash donations and in-kind support from local businesses and citizens. If you would like to volunteer to be a part of the effort to improve and maintain this valuable resource in our community, contact Mike Moracco in the Town of DeWitt Recreation Office (315)446-9250 x 9. Park Bench sponsorships / memorials are still available. $2,500 includes the bench, placement along the trail and an engraved plaque. For more information please contact the Rotary Club of Dewitt.